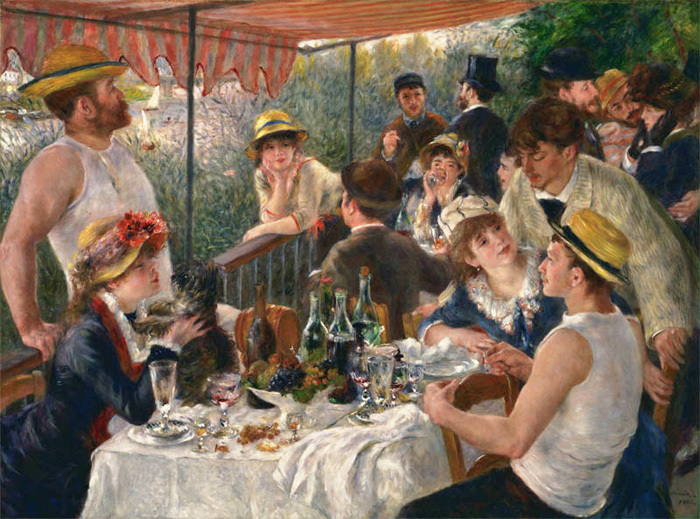 The upper left hand corner of Luncheon of the Boating Party, beyond the awning, Renoir included the blue-gray outline of the Chatou railroad bridge -- a visual reminder of the government's recently completed transportation projects that had made this riverside fête possible. By the 1860s, new French railroad lines changed many rural areas along the Seine surrounding Paris into suburban sites for leisure. The railroad crossed the winding path of the Seine, providing weary Parisians with many accessible weekend retreats. From his Paris studio, Renoir, for example, could walk ten minutes to the Saint-Lazare train station and catch -- on the half hour -- a train for the suburbs. One of Renoir's favorite places was the town of Chatou where, on a nearby island, he painted Luncheon of the Boating Party that depicts a group of his friends on the balcony overlooking the Seine at the Maison Fournaise. SPECIAL NOTE : The painter will make the reproduction as close to the original oil painting as possible. If you want your painting to alter from this likeness, please email us and " The Luncheon of the Boating Party , 1881 " will be reproduced according to your special requirements.